OUTDOOR ART! Whether you know it or not, chances are you’ve seen some of the artwork of Mike Parsons. His claustrophobic black and white cityscapes and comic book monsters adorn numerous walls in Kensington Market, Chinatown, and around Queen Street West. All of his works are intensely complex- from detailed crowd scenes to surreal depictions of Toronto landmarks- and they are instantly recognizable by the distinctive, eye grabbing simplicity reminiscent of other urban artists like Banksy or Neck Face. What you might not know is that Parsons has probably seen you, too. Working as he often does from the corner of Queen West and Peters Street- where his rough-hewn canvasses spread out directly on the sidewalk amidst the tourists, homeless, street vendors, and hipsters, making for a crowd gathering spectacle bordering on performance art- Parsons has spent the better part of the past decade chronicling the secret life of Toronto. Look closely at one of those crowd scenes and you might just see yourself. When I meet up with Parsons in his second floor studio office at Spadina and Richmond, I half expect to find an elaborate black and white mural winding down the hallway leading towards his door. Instead, the building is fairly nondescript; even inside the shared studio office there is little clutter, and Parsons’s works are stacked neatly against the wall. He is however, clad in his trademark all-black ensemble of combat pants, t-shirt, and ball cap- a look that’s both stylish and practical for someone who works exclusively with black ink. The office is a step up from the wall to wall artwork in his Kensington Market live-in studio, and a clear sign thast Parsons’ reputation is finally catching up to him. 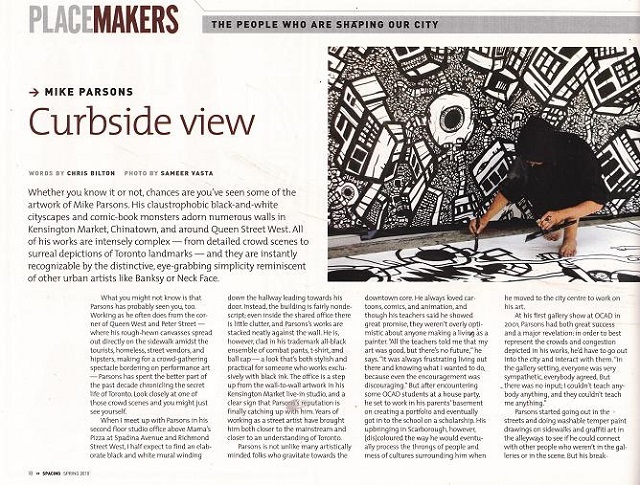 Tears of working as a street artist have brought him closer to an understanding of Toronto. Parsons is not unlike many artistically minded folks who gravitate towards the downtown core. He always loved cartoons, comics, and animation and though his teachers said he showed great promise, they weren’t overly optimistic about anyone making a living as a painter.” All the teachers told me that my art was good, but there’s no future,” he says “It was always frustrating living out there and knowing what I wanted to do, because even the encouragement was discouraging.” But after encountering some OCAD students at a house party, he set to work in his parent’s basement on creating a portfolio and eventually got into the school on a scholarship. His upbringing in Scarborough, however, (dis)coloured the way he would eventually process the throngs of people and mess of cultures surrounding him when he moved to the city centre to work on his art. This is also when Parsons started working on large scale paintings in public places, like the construction hoarding around the then under construction Sharp-Centre for Desing ( a feat which took two carefully planned nights for him to cover the 200 feet of white walls with iconic monsters). Though it wasn’t a commissioned work he was confident that the school wouldn’t mind such a creative use of free space. And whether or not they took issue with the “Roach” mural, it lasted for a couple of years. Incidentally, Parsons ended up doing a lot more commissions from then on- and meeting more people who were already familiar with the work. This outdoor art article appeared in the Spring 2010 edition of Spacing Magazine.